This early in the year we’re too accustomed to what movies are hitting theaters. January and the early parts of the year are typically seen as dumping grounds, the movies that studios don’t actually believe in or the ones that came out in the exact shape of a cookie cutter that audiences will see right through. It’s easy to look at the marketing for The Prodigy and assume the film is just pulling from the clearly labeled file of “Evil kid movies” and bringing nothing new to the table, but the film makes surprising choices and dares to do things that most studio horror movies would never in a million years even hint at, for that, it has my respect. 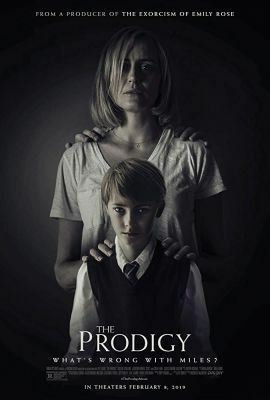 The Prodigy tells the story of Sarah (Orange is the New Black‘s Taylor Schilling) and her son Miles (IT‘s Jackson Robert Scott), who’s intellectually gifted but often shows strange behavior or does peculiar things. It’s to be expected of a gifted young boy, but speaking in Hungarian in his sleep and catching spiders to kill them is a different problem altogether. Through the help of a specialist, Sarah is told what the problem could be, tying into a prologue that we won’t dare spoil and creating a story that is far more unique than genre tropes would have you believe. Director Nicholas McCarthy and screenwriter Jeff Buhler have crafted a taut and clean thriller of a horror movie here. Though sometimes the rules are played fast and loose, the stakes are continuously escalated with a premise that could easily become out of hand and goofy if not reeled in at the right moments. Certain scenes do send waves of snickering through the audience to the effect that it makes one wonder if it was the intention, since it’s a tonal shift that doesn’t match much of the rest of the film, but those quickly turn sour as we’re plunged deeper into a movie of horrifying choices. Overall though it’s a story that has its beats and logic at its core and pushes the audience into a corner, making them think “The movie won’t do that” and then doing exactly that. It’s remarkable to see these scenes push the envelope in ways that aren’t revolving around gore or actual explicit imagery, but the images that they will conjure in the audience’s own minds. There’s a disturbing quality that feels fresh here, something sinister in the film’s soul that sets you on edge the whole time. None of this would work if it weren’t for Jackson Robert Scott either. The ten-year-old actor is running circles around his adult counterparts in the movie, bringing a stunning amount of work to a character that could have easily become a meme if handled poorly. Scott can turn at the drop of a hat from angelic to malevolent and from innocent to perverse. Without showing the hand of the movie too much, it’s extraordinary to watch him in the film. It’s the kind of performance from a young actor that we’ll be talking about for years and realizing we’re seeing magic on the screen. Taylor Schilling works off of Scott with success, but doesn’t truly shine until she finds herself unraveled by the third act of the movie. To get there though the film starts to fall into similar traps, treading water while setting up the next set of dominoes to knock down; luckily it makes a unique pattern of dominoes and knocks down a vase along the way for a satisfying crash. In the end, The Prodigy goes out of its way to blaze a new path in killer kid movies without leaning too heavily on the same types of movies that have come before…until the film comes to a close. All-around however, it’s is a worthy addition into the canon of killer kids with a fresh take on the material that never feels derivative. A treat for fans looking for a new escape. The post The Prodigy Review appeared first on ComingSoon.net.